Not long ago, I thought I was going to be writing this column from a motorhome parked in Lake Tekapo, New Zealand. I was temporarily stuck for a reason very rarely experienced in Australia. Backtracking slightly, like our fearless editor Laura, I like to do a bit of hammering around the ski slopes in winter. This year, I opted to borrow a motorhome out of Christchurch, NZ, and head south to the Wanaka region, which has easy access to the ski resorts of Cardrona and Treble Cone. My motorhome was a Roller Team Rambler, an Italian-built motorhome designed for the British and New Zealand markets, so the entry door is on the nearside and, apart from the manufacturer, all the appliances and components in the motorhome looked pretty familiar to me, including the Fiat Ducato base vehicle. Like many Ducato-powered motorhomes out of Britain and Europe, it came with the lowest powered Fiat turbodiesel, the 2.3L 96kW engine. That is something that we, in Australia, find a bit unusual, because most of the Ducato-powered motorhomes that are built in Australia come with the more powerful 3L/132kW unit. Generally speaking, the small engine performs well on flat roads and moderate hills but, on steeper hills, like those commonly found in NZ, it lacks a little grunt. A point of interest with the six berth Rambler motorhome is its weight. It clocked in with a Tare weight of 2992kg and a GVM of 3490kg. The reason for the latter is that there are two levels of annual registration check in NZ – the Warrant of Fitness (WOF) and the Certificate of Fitness (COF). The WOF is an easier check but is restricted to vehicles that weigh less than 3500kg and does not included any passenger service vehicles or rental vehicles. That last item includes rental motorhomes but not privately-owned ones. The driver’s licence system in NZ is roughly similar to ours, except that motorhomes up to 6000kg can be driven on a car licence. So how did I get stuck in Tekapo? I was on my way from Wanaka to Christchurch and passed through the town late one afternoon on my way north. It started to snow quite heavily and, I have to tell you, driving through the snow at dusk is a pretty unnerving experience. In the past 30 years that I’ve been visiting NZ, this is the first time that I’ve seen heavy snow on the main roads. I’m used to fitting snow chains on ski resort mountain roads in the daylight but doing that at night is a different matter. Or would be, if I happened to have snow chains with me! It’s a requirement in NZ that all rental motorhomes carry chains during the winter but mine wasn’t a rental motorhome and the chains had somehow been overlooked. However, a benefit of the front-wheel-drive Ducato is that fitting chains to the front wheels is not only easier than the rear wheels, but the chained wheels offer traction, steering and braking all on the one wheel. Between Lake Tekapo and the small town of Fairlie to the north is a little place called Burkes Pass and, like similar passes in the South Island, it’s vulnerable to snow and icy conditions. I simply wasn’t sure whether I could get through or not, so I headed back to Tekapo and the local caravan park, where a considerable number of other motorhome travellers had opted to stay put as well. Last month, I briefly mentioned LP gas and diesel-fired space heaters. Here’s a good reason for diesel heaters. My Rambler heater was LP gas-fired and, on a night where the temperatures dropped below 0°C, I was planning on making full use of the heater. Or, I would have done, had my only gas cylinder not been empty. The fact that I had a full diesel tank was no help at all, and it was a pretty chilly night, to say the least! The rest of the time, the gas-fired heater fitted under the main bed not only did a good job of keeping the bed warm but dried out my wet ski gear as well. The next morning, everything was covered in a soft white blanket and, after getting some great photos, the big debate was whether to head north and risk a road closure or double back and head south out to the east coast. Not having snow chains made that decision easier and, on the advice of the local tourist bureau, I doubled back, making a long detour to Christchurch and saw a bit of NZ that I have not seen before. I also saw a good cross-section of all weather conditions - everything from brilliant sunshine to, ironically enough, driving in snow when I finally arrived at my destination. 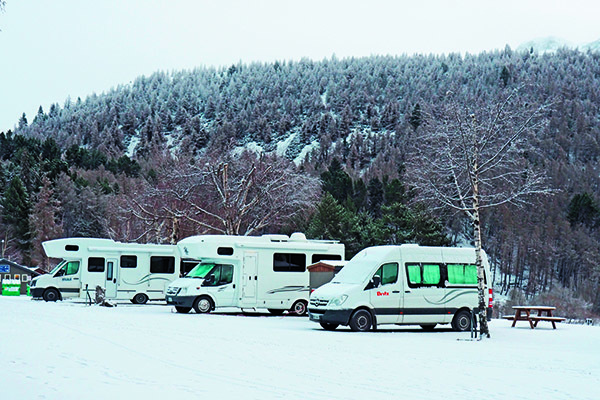 The moral of the story is, whether you’re travelling in Australia, New Zealand or somewhere else, make sure that your RV is fully prepared for whatever conditions you may encounter, everything from dry desert to snow covered roads.